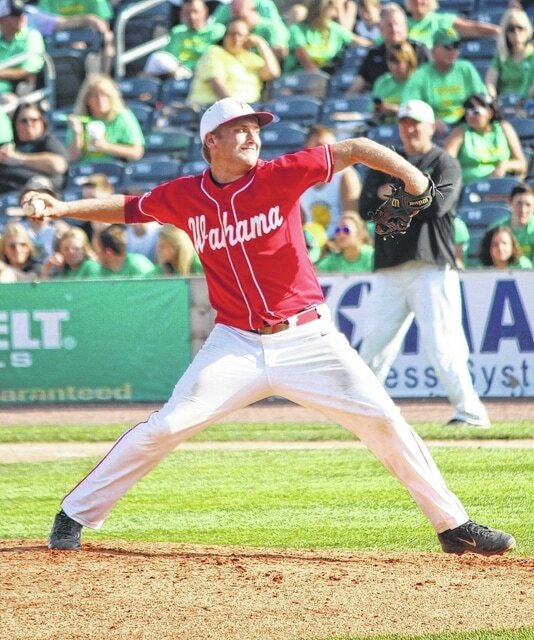 Wahama sophomore Philip Hoffman delivers a pitch during a 2015 Class A state semifinal baseball game against Bishop Donahue at Appalachian Power Park in Charleston, W.Va.
CHARLESTON, W.Va. — The West Virginia Sports Writers Association recently released its 2015 Class A All-State baseball teams. Mason County had two selections on the 2015 teams, both from state champion Wahama. Sophomore Philip Hoffman earned a spot as a pitcher on the first team for the White Falcons, while junior Kaileb Sheets was selected as a second team pitcher. Wahama finished 25-7 and won its final four games en route to the program’s third state title. The first-team captain was Man senior Braden Griffin, while Moorefield junior Will Schoonover was named second team captain. P — Jesse Padlow, Bishop Donahue, Sr.
P — Michael Stout, St. Marys, Sr.
P — Philip Hoffman, Wahama, So. C — Kurt Latocha, Clay-Battelle, Sr. IF — Josh Baker, Notre Dame, Jr. IF — Jake Boice, Parkersburg Catholic, Sr. IF — Bryce Strawderman, East Hardy, Jr. IF — Brian Campbell, Wheeling Central, Jr.
OF — Austin Wetzel, East Hardy, So. OF — Ian Riggleman, South Harrison, Jr.
OF — Dakota Watson, Williamstown, Sr.
UTIL — Sam McKown, Charleston Catholic, Sr.
UTIL — Austin Williams, Moorefield, Sr.
UTIL — Samson Cropper, Clay-Battelle, Sr.
P — Jacob Bishop, Greater Beckley Christian, Sr.
P — Kaileb Sheets, Wahama, Jr.
P – Holden Sions, Moorefield, So. IF — Jesse Lambert, Pendleton County, Sr. IF — Nate Bakaitis, Wheeling Central, Sr. IF — Drew Lett, Doddridge County, Jr. IF — Luke Cooper, Paden City, Jr.
OF — Aaron Lowe, Sherman, Sr.
OF — Tim Heavener, Pendleton County, Sr.
OF — Tyler Smith, Moorefield, Sr.
UTIL — Austin Ratliff, Gilmer County, Sr.
UTIL — Jordan Miller, Notre Dame, Jr.
UTIL — Thad Jameson, Charleston Catholic, Sr.
UTIL — Braeden Hurst, South Harrison, Jr.
Justin Everly, Trinity; Alex Murray, Notre Dame; Dakota Jarrett, South Harrison; Jessy Miller, South Harrison; Dalton Dempsey, Fayetteville; Brett Green, Greater Beckley Christian; Nick Boggess, Greenbrier West; Beau Whittington, Buffalo; Liam Bailey, Charleston Catholic; John Thomas Keffer, Man; Colby Buchanan, Tyler Consolidated; Zach Heasley, Paden City; Trent Hardbarger, Wirt County; Nick Roedersheimer, Parkersburg Catholic; Luke Cooper, Pendleton County; Troy Farrell, Fayetteville.